SUP yoga has been making a big splash in the fitness and wellness world because it’s a fun, outdoor practice that adds a unique balance challenge. There are endless postures to practice and yogis will like each one for different reasons - physical benefits, playfulness, level of challenge, etc. Not all poses will work for all bodies or experience levels but can always be modified to meet each person where they are in their present state. Like “land yoga,” SUP yoga postures can be modified when needed and you can use your board and paddle as a prop, similar to a block or strap, to stabilize and explore the depths of any pose. SUP yoga has many benefits, improving mental, physical, and emotional well-being. Practicing grounding techniques is key to feeling balanced in this ever-changing world, moving rapidly around us, and can be done through simple beginner postures. Below are a few of my favorites that can be practiced alone or sequenced together. Chair Pose (Utkatasana): This posture is great for physically grounding by activating muscles in the legs and anchoring through them in a standing position. The paddle can be used for an extra source of stability and then released for increased balance challenge. How To: Position feet hip distance apart on either side of the handle. Place paddle blade centered on the deck pad an arms distance in front with hands shoulder distance high on the shaft. Lift and spread toes, activating the foot arches and feeling the 4 connected points (big and little toe mound, inner and outer heel). Soften the toes, send the knees directly forward (not splaying in or out), tail back, and head away from tail into a hovering seated position, while holding on to the paddle for stability. Bring weight back into heels and be sure knees aren’t surpassing toes. Gently squeeze inner thighs to activate the deep abdominal system. Pelvis is neutral (neither lifting nor tucking the tail) and spine long (neither extending or flexing). Visualize dropping legs all the way down through the board onto the waterway floor. Breathe. To advance, move dynamically in time with breath, inhaling as you lower into chair, and exhaling as you press down through the legs to rise up to standing. Then from chair pose, lift the paddle overhead so you’re no longer relying on it for stability, bringing biceps in line with ears and shoulders relaxed down. Table Pose (Bharmanasana): A stable beginner posture by physically anchoring through 4 points of contact at a lower center of gravity on the hands and knees. A great transition posture and prep for intermediate poses like plank, downward dog, and balancing tabletop. How To: Kneel down on all fours with navel centered over handle, shoulders stacked over wrists and hips over knees. Spread fingers wide and even, pressing down through knuckle pads and palms so the hands feel plugged in to the deck pad. Draw navel in towards spine for support and lengthen the spine so the tail is reaching back and crown of head is reaching forward in opposition. Engage feet (toes flipped under) for more stability or press down through tops of feet if they’re flat. Breathe. To advance: Extend and elevate the right leg behind, pressing back through heel and keeping hips square. Then, come onto the right fingertips taking weight out of the arm. Once stable, extend and elevate the right arm ahead with bicep beside ear into balancing tabletop. Child’s Pose (Balasana): Typically used as a resting posture, this pose is very effective for mentally grounding. The light pressure of the forehead resting against the deck pad activates the parasympathetic nervous system, calming the mind and relaxing the body. How To: From all fours with navel aligned over handle, bring big toes together behind with tops of feet flat onto deck pad. Sink hips back toward heels and let ribs rest down toward thighs and forehead to release toward deck pad. Stretch arms ahead. If the forehead doesn’t reach the deck pad, bend elbows and stack fists to create an elevated pillow for the forehead to rest so the neck can soften. Breathe. This posture is intended for recovery and not typically advancement, but can be varied to achieve different stretches. Try widening the knees and allow side ribs to nestle down between inner thighs. Or, stretch the arms over toward the right rail, hips sinking toward left heel and vice versa. Boat Pose (Navasana): This pose is great for physically grounding from a seated position, integrating the deep abdominal muscular system. It’s a great posture for beginners, with a lower center of gravity for increased stability and eliminating the fear of falling. You can also use the paddle as a prop to assist in maintaining proper spinal alignment. How To: Position sitz bones just in front of the handle, knees bent, feet flat. With the paddle across the deck pad in front of you, step feet over the shaft and pick it up with an underhand grip. Pull the shaft against hamstrings by bending elbows to 90 degrees and drawing them back to side ribs, with shoulders relaxed. Use this isometric as leverage to keep the spine long (avoid collapsing into a rounded spine). Engage mula bandha (Sanskrit for “root” and “lock”) by squeezing inner thighs and drawing pelvic floor muscles in and up. Magnetize low abdominals toward the low back and navel toward spine. Visualize anchoring the pelvis down through the board and floating the crown up to the sky. Shift weight back, taking weight out of feet and come onto tiptoes. Try lifting one foot, then the other foot, working to lift both at once keeping knees bent at 90 degrees. Breathe. To advance, extend legs into a longer lever with feet at eye-level, maintaining length in the spine and a flat back. Then, release the paddle isometric by extending arms like offering the paddle as a gift. If collapse occurs in the torso simply return to the paddle isometric to regain proper alignment. Bridge Pose (Setu Bandha Sarvangasana): An effective pose for grounding physically through the legs and back body from a supine position. The bonus is, the more anchored down in this posture, the bigger the front body opening! How To: Lie on back with hips in front of the handle, knees bent, soles of feet flat on deck pad hip-distance apart and heels in close. “Robot” arms at sides with elbows bent at 90 degrees and hands reaching up toward the sky. Tuck tail by drawing low belly in and press down through legs (knees tracking forward) and back of arms, slowly rolling up vertebrae by vertebrae to elevate hips into a gentle backbend. Pull navel in toward spine to protect back from hyperextension and keep head in neutral. Breathe. Roll back down grounding through each vertebra, and resetting the spine, lowering the hips with control until finally the tail settles onto the deck pad. To advance, release forearms from “robot” down to sides. Then shimmy shoulder blades in toward the spine, clasp fingers underneath back and extend arms toward heels to deepen the backbend. Try “stomping on the sky” by elevating one leg pressing up through heel while simultaneously rooting down through the base leg. Corpse Pose (Savasana): The mother of all yoga poses – this is what the physical practice is leading up to – preparing the body for relaxation and the mind for meditation which is mentally, physically, and emotionally grounding. The goal is to calm the relentless mental chatter to a single-pointed focus and then ultimately to think of nothing. 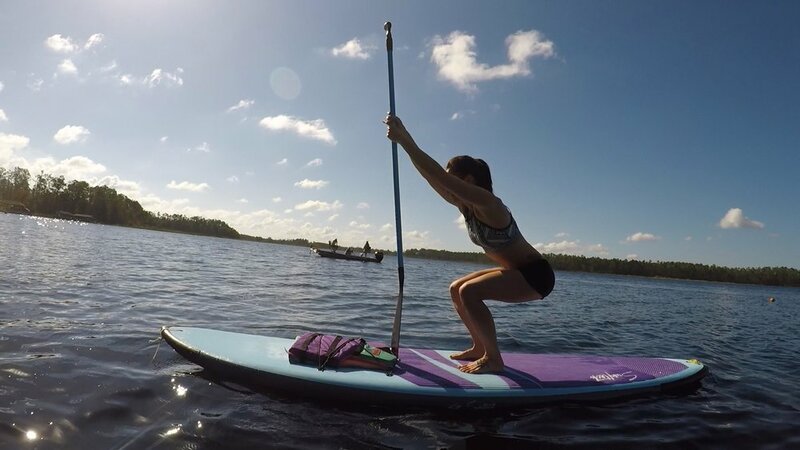 This is an especially unique experience on a stand up paddleboard as you float weightlessly, literally going with the flow and becoming one with the water energy beneath you and the outdoor environment of the surrounding you. How To: Be in an appropriate, safe space and have a partner or instructor to be on the lookout. Recline on back with hips centered just in front of the handle. Stretch legs out front, the paddle lying across the board with the shaft securely under the bend in the knees, feet shoulder-distance apart. Rock legs in and out until feet fall open naturally. Slide shoulder blades down the back and bring arms into a low V at sides, palms face up. For the full SUP experience, let hands dip into the water to connect with its fluid vibrations. Rock head gently side to side to find a comfortable place for it to rest. Make any final adjustments so you can rest in stillness for the next 5-10 minutes. Close your eyes and imagine a wave of relaxation washing over your body from head to toe - any tension, stress or distraction drifting away. Allow your breath to become easy and effortless. Notice the sensations you’re experiencing. Give yourself permission to let go of expectation, identity, or anything you may be holding on to and just be, just as you are in this moment of ahhhhmazing peace. To advance, keep patiently practicing your meditation. It will gradually become easier over time and with consistency. We live in a busy, fast-paced society and it’s important to practice techniques that help us slow down, relieve stress, and unite our mind, body and spirit. SUP yoga does just that, with the added benefits of being outdoors and on the water. So give it a try and enjoy the experience of enhanced well-being. Namaste y’all!